Sky’s out, thighs out! 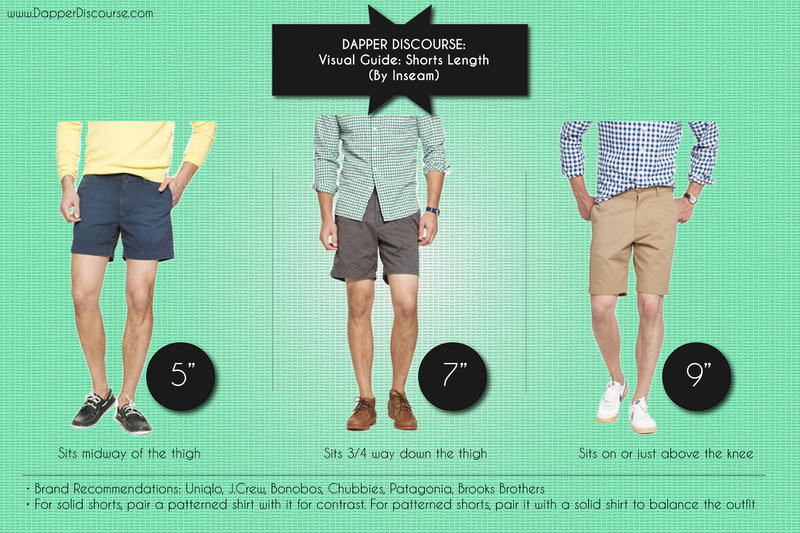 Shorts weather is coming very soon and I wanted to discuss the length of your shorts, otherwise known as the inseam. Visualize the upside down “V” created by the outline of your shorts. The inseam is the measure of the peak of the “V” to the bottom hem of your pants. The most prevalent inseams men should be wearing are 7″ and 9″ inseams. I would advise against any shorts with a longer than 9″ inseam. 7″ is the shortest I’d personally recommend, but there are cases when it works. The 5″ inseam is a finicky beast. To tame it, you should have thighs on par with those of Greek statues depicting the jacked heroes of the “300” time period. I wouldn’t recommend it in most cases, but some people can actually pull it off. 1. Utility – It’s hot. In 75-100 degree weather, the shorter the better! If you were going to wear long pants, commit to the capris/cropped pants or get out! 2. Aesthetics – Clothes should streamline the natural lines of our body and shouldn’t be too loose or flair out. The longer the shorts are, the more likely the chance that there’s too much material involved and the hem will be too loose or god forbid, flair out. 3. Confidence – Be proud of your man-calves! As long as you’re not skipping leg day, there’s no reason you should be ashamed of having scrawny or too-hairy thighs. Feed ’em some Vitamin D! When it comes to the material, most of them will be cotton. If you can find some lighter materials like seersucker, chambray, linen, or madras, it’ll give your ‘fit more character. You don’t have to be a douche to wear shorter shorts. Don’t be surprised if you’re mistaken for one though. Per usual, avoid the cargo and rock those shorts! If yours has a pattern (like a monogram or stripes), consider pairing it with a simpler shirt to balance the outfit. If your shorts are plain, I recommend a patterned shirt (fine gingham, stripes) to give your ‘fit some character. As far as footwear goes, consider white bucks, Nike Killshots (or similar style low sneaker) , or you can default to boat shoes (if you’re newer to this style and don’t really know where to start). But I’m starting to derail from the main point so I’ll just leave it at that. take information regarding my presentation topic, which i am going to present in university.